Not long ago, all I knew of the agave plant was the printed picture on bottles of tequila. We’ve had a few of those in my kitchen, and the subtleties of varieties is akin to appreciating the nuanced differences in a bottle of wine. I also believed the tale that the Century Plant was so named because it bloomed only once every one hundred years. At least one part is true: it blooms only once before it dies, but for this versatile plant, a single bloom has multi-use potential. When making margaritas, my husband is a purist. Three ingredients of equal measure: tequila, lime juice, and orange liqueur. Shake with ice and enjoy on hot summer evenings (or any time of year!). Also called maguey, the century plant, or agave, has been used extensively for centuries. The stalk, which when it arrives can grow as much as twelve inches a day and soar as high as forty feet, was often used to make fence posts. The plants tough fibers were used to make thread or twine. Agave syrup is sweeter than honey. I like it poured over my homemade plain yogurt sprinkled with black walnuts. Yum! Or, for a healthy sweet treat, try boiling carrot slices and dressing them with agave syrup and cinnamon. Steamed agave flowers, young, tender, and mixed with herbs, are nutritious. So are agave seeds! And the hearts of the plant, usually roasted for at least two days, can be a tender addition to dinner. Bows, baskets, fiber for clothes… including using the thorns to makes needles! The dried leaves can be smoked like tobacco. Fermented, the sap can be made into vinegar. Or, leaf extract lathered and used like soap. And if you can find them, maguey leaves can be parboiled, wrapped around meat, and placed into a slow cooker for at least eight hours. Drop some roasted green chiles and pulled beef into a warm tortilla—the result is melt in your mouth magic! There is a lot to say about the versatile agave, but why listen to me when you can watch the movie? Now if you’ll excuse me, my husband is mixing something up in the kitchen. I think he needs my help! What images come to mind when you think red? Little red dress? Red lipstick? Blood? Red has a diversity of symbolism. Power – The British army had red coats to denote virility during the American Revolutionary War. Red stimulates hunger, so it’s is a great color to use in the dining room. (Conversely, if you’re on a diet, blue suppresses appetite). Red attracts attention. Stop lights are red. In the movie The Sixth Sense, the door knob to the basement is red. Why do you think that is? In the book The Great Gatsby, red, along with a myriad of derivatives (rose, wine, crimson, pink… etc.) depict power, passion, wealth, and of course, death. Red is beautiful, but extracting it to make natural dyes and paints requires ingenuity. And Colonial Spanish monarchs loved a splash or red… or more. Before synthetic dyes, the color came from carmine lakes. This general term applies to natural substances used to make dye, such as red ochre, brazilwood, safflower, cinnabar, and madder. When the Spanish arrived in Aztec Mexico, they were very interested to discover that part of Montezuma’s tribute included bags of bugs they called cochinilla, or cochineal. (European oaks have a type of cochineal once used by Hebrews to color curtains for tabernacles.) And these little guys create deep, rich red, a perfect gift to bring back home. Cochineal is a little bug that attaches itself to certain cacti, and there they stay. The bugs are harvested, dried, ground into powder, and used as dye in many products including food! During the Colonial period, Oaxaca, Mexico is said to have exported almost two-million pounds of cochineal to Asia, Africa, and Europe—most of it used exclusively to dye fabrics for the wealthy. After gold and silver, cochineal was a highly sought commodity. Therefore, the Spanish did their best to hide the source and encourage misinformation about the source of their red dye. I wonder how many French came looking for berries when they should have been searching for bugs? A predominant artifact in Colonial Spanish Mission churches is the santo, or statue of a saint, including the crucified form of Christ. Today, santos that have not been repainted are rare. The original artists would often use oil paints or paint in egg yolk called tempera. As the santos were cleaned, the paint usually rubbed away, which necessitated a repaint. To study the layers of paint is to look at history. To read about Santos construction, click here. To learn more about cochineal, click here. What is one thing in your home, piece of clothing, furniture or display item that is red? 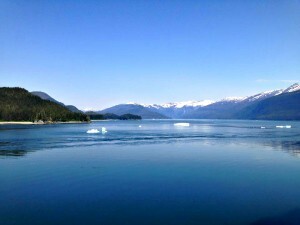 Recently I spent a spectacular week in Alaska while learning story skills from the brilliant founders of Catharsis (StoryCatharsis.com). The classes were amazing. The weather was not what I had expected. Isn’t Alaska supposed to be cold? I baked in flannels and sweatshirts because of the 80° heat. But the views were clear, as you can see from the two posted photos. 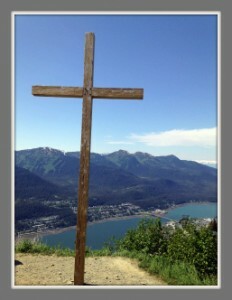 I could share many stories, but since everybody loves a mystery, I stumbled on a good one.While hiking up to Father Brown’s Cross in Juneau, I wondered: why did he blaze the trail in the first place? And who is Father Brown anyway? The stats are easy enough to find: Edward Howard Brown, born in Baltimore, MD 1860. Attended Jesuit Loyola College (MD), Georgetown University (D.C.), and College of the Holy Cross (MA). Taught at Georgetown and also for two years at Fordham University. Not surprisingly, he entered the Jesuit Order (at age 19). Eventually, he volunteered for the Rocky Mountain Mission and arrived in Juneau in 1904. The details of Father Brown and his cross are more covert. And so… the mystery continues. Who is Thomas P. Wickes? To find out more about Father Brown, I tracked down a man named Thomas P. Wickes, assistant corporation counsel lawyer for New York City. Born in Albany in 1853, he was only seven years older than Father Brown. As it happened, Mr. Wickes enjoyed hiking in the Adirondacks, and it was he who first laid out the route from St. Hubert trailhead to the 4736′ high Gothics Mountain. (Today, there are many trails that lead to the peak.) Mr. Wickes also, it is believed, is the first European to climb Armstrong Mountain, having completed that feat in 1875. Now here’s where the trail goes wonky, but bear with me. Pertinent to Father Brown’s story, Mr. Wickes was indicted for writing “annoying letters” under the name of Lewis Jarvis (NY Times, June 14, 1905). Strange days indeed! He was convicted, his name stricken from the roll of attorneys, and sentenced to remain a year on Blackwell’s Island, the lunatic asylum for the city of New York. After serving seven months, he was paroled on the condition that he “…go west and never return to this city.” (To see the article, click HERE.) It caused quite the hullabaloo, so much so, that Alaska territory was forced to review clemency as part of its constitutional scheme. The deeper I dug, the richer my reward. Alaska still prompts a rush of sorts! Even so, I wonder if before leaving for the western frontier, Father Brown may have met the illustrious N.Y. lawyer in person while they both lived on the east coast. If not, they certainly met in Alaska. This much is certain: Mr. Wickes mountaineering enthusiasm ignited Father Brown’s sense of adventure. In 1906, Mr. Wickes suggested Juneau have its own Trail Association, and the good Father once again volunteered. The trail was completed in June 1908. Father Brown did place a cross on the pinnacle, but his original cross has been replaced many times. If you’re interested, Alaska Digital Archives has a picture of Father Brown. He stands with school children in front of the Juneau Parochial School, photo dated 1910. Something else I learned in Alaska: There is melancholy in the road not taken, but move forward we must. I think Father Brown, having left his eastern roots for the big wild west, took the road less traveled. And I am glad. The view from the peak is glorious. Vogue. Not the magazine, but vogue as in something popular, and in this case … hidden. Ancient, yet new. Once upon a time, a few hundred centuries ago, women who did not want or could not join a Roman Catholic religious order (think nun) had another option. They could become consecrated virgins. I’ll explain in a minute. But first, in my book The Legend of the Kneeling Nun, the main character spends a lot of time with beatas — women who do not marry, nor join an order of nuns, but continue to live in the world while taking a vow of chastity. Beata is a Spanish term that describes "A single woman, usually a widow, who led a form of religious life without belonging to any order, often wearing distinctive garb and engaged in charitable works." This definition is supplied by the Society of Hispanic Historical and Ancestral Research, Compilation of Colonial Spanish Terms and Document Related Phrases, Ophelia Marquez and Lillian Ramos Wold, 2nd Edition, 1998. Notice “usually a widow.” Which means not always. As was the case of Sister María de Santo Domingo, the beata (or holy woman) of Piedrahita, Spain. She was a “tertiary” or third order religious. First Order religious are those who take full vows of an Order, such as the Franciscans or Dominicans. Second Order are contemplatives of who associate with one of the first Orders. This is an extremely abbreviated definition of a complex subject. My interest in the beatas of Colonial Mexico resulted in no small amount of research, but the study of the Orders and religious Orders in general opens an understanding of how widespread are Catholic systems while the religion as a whole maintains a singular belief, as explained in the Nicene Creed. Certainly, these women decide on one husband to concentrate all their affections. They are brides of Christ. As I think about chastity, or any choice to deny the body certain pleasures or needs, such as fasting, the decision in itself means nothing unless the point is to focus on something so good that the act will clear the mind’s eye for an unclouded vision of truth. I measure the passing of time by seasons; whether there’s snow in the forecast or flowers in the garden. My husband, on the other hand, judges time by the game: football, basketball, baseball … but he would be at a loss to explain Ulama, an ancient Mesoamerican ball game played by the Aztecs and Mayans. These players covered their chins, hips, elbows, knees, and thighs with deerskin to protect them from bruising as they used their bodies to hit a large rubber ball. The object was simple: never let the ball touch the ground, and without using hands, send it through a large stone hoop. I found a video link if you’d care to watch a reenactment (Click HERE). Or, if you have ever seen the cartoon DreamWorks movie El Dorado, you might remember Tulio and Miguel cheating to win. I discovered this game while conducting research on the Francisco Vazquez de Coronado expedition to find gold in the years 1540-42. As the army traveled through Sinaloa, Mexico, they stopped at the Spanish colony of Culiacan where the native people played the game for sport, but also to win wagers. Ancient Ulama ball courts, some dating back to the fourth century, have been discovered in western Mexico. Excavation has uncovered rubber balls dating back to about 15oo BC. And some have said that in lieu of balls, men lost their heads to play. Literally. Armchair archeology can dig up lots of interesting facts, and much of it helpful to enhance a fictitious story. But I must rely on imagination to watch 16th Century conquistadors play Ulama. Picture if you will, don Francisco’s soldiers, many in quilted cotton armor (quite good at keeping arrows from embedding flesh), kicking around a hard handmade ball, sweating in the humid coastal air, and sharing a few maguey drinks after the game (blue agave is brewed to make tequila). A shopping mall is my area has a Catholic bookstore, so I went inside to see what they had in their fiction section. I passed by a lot of plastic trinkets probably made by Chinese Buddhists, and the usual jewelry, rosaries, crosses, baptisms and confirmation gifts, etc. on my way to the books. There I found nonfiction titles on parenting, apologetics, vocations, liturgy, and the like. But I couldn’t find any fiction. A clerk asked if I was doing okay (I was), and if I had found what I was looking for. Actually, I told her honestly, I could use some help in that regard. All I found was a blank stare. So I began to explain. Now it was my turn to respond with a blank expression. Our dialogue continued for a while longer, and the clerk assured me there was no fiction in that store, and for that matter, no such thing as Catholic fiction. I thanked her and headed for the door, when to my right I saw the video selection. So I called my new friend back. “Yes, history proves that these events actually happened, but …” I could see I wasn’t making any headway. I began to wonder if she was right, so I decided to investigate elsewhere. First, I found a discussion thread on this very topic on Goodreads (CLICK HERE). Next, Tuscany Press, publisher of Catholic nonfiction and … fiction broaches the subject (CLICK HERE). Then, there’s CatholicFiction.net (CLICK HERE). Finally, the Catholic Writers Guild has several blog posts regarding Catholic fiction, including (CLICK HERE). There are many excellent Catholic authors who write fiction, but their work may not have a Christian theme. If not, their work may not qualify to be placed in a Catholic bookstore. But if an author writes a story that inspires Catholic/Christian ideology, wouldn’t that be acceptable and shouldn’t that be available to anyone who goes into a Catholic bookstore looking for good fiction? I would love to hear your thoughts on this matter. And if you’d care to share a few titles, that would be great too. In the meantime, I may copy a list of Catholic fiction and bring it with me the next time I go to the mall. And that is as real as it gets. As the story goes, I was eating a chile rellano (a cheese stuffed anaheim pepper that I like dressed with red chile sauce), and between delicious bites, my husband said we would have time to go to the Spanish Colonial Arts Society Museum. I ate a little bit faster. I had been hoping to visit “the only museum in the country dedicated to exhibiting and interpreting the art of the Spanish colonial period including Hispanic New Mexico” (verbiage taken from the society’s website) for a very long time. If we hurried we would have two hours to peruse their collection of Spanish Colonial art. Generally, this period begins in 1492 when Columbus sailed the ocean blue and ends in 1810 when Mexico began its campaign to win independence from Spain, which they did in 1821. In many southwest regions of North America, Europeans (mostly Spanish and Portuguese) came to conquer the land and people. The precolonial civilization was subjected to disease, slavery, theft of their lands and commodities, and other atrocities beyond the scope of this short blog post (if you’re interested in knowing more, research, for example, “American Indian Boarding Schools”). When the Europeans came, they carried their own expressions of art, much of it symbolic of their religion. They also brought their own style of architecture and textiles. But many of the supplies required to create these objects were hard to come by in the New World. In their ingenuity, the Europeans sculpted (or had talented indigenous peoples carve) wooden statues of saints, sturdy mesquite wood furniture, and weave fabrics made from local materials. Sometimes, shipments arrived from the Old World to supplement the common ware. And fine examples of these things are in the Spanish Colonial Arts Society Museum … or so I have been told. We left the restaurant and I noticed broken glass by my car door. You know what happened. Somebody got my spare purse (that contained only a blank notebook and a pen), while my purse filled with credit cards, money, and other important stuff was left lying on the floor of the back seat. I guess I was so excited to eat that rellano, I had forgotten to take my purse! However, I must add, I never go anywhere without my purse, which is a testament to the great food in Santa Fe. We spent the next two hours cleaning broken glass from the car seats and taping a garbage bag to the window until we could get it fixed. Yes, the break in was bad, but not as bad as it could have been! The food is great! And the thieves are really stupid. Do you have a break-in story? The first time I tasted an avocado, I was nineteen years old. I remember because it was a luscious experience, and avocados have been a mainstay in my diet ever since. I was at a party in Laguna Beach, CA with one of my dearest friends. Everyone brought appetizers to share (no idea what I made and most likely no one else remembers either). One guest brought in several dark greenish-black lumpy ovals that looked to my uneducated eye to be rotten. She plunked them on the counter, and I watched with a skeptical eye as she took a sharp knife, scored a deep line beginning at the stem and moved the blade down and back up along the other side. That done, she twisted the fruit until it came apart to reveal a burgundy colored golf ball sized pit. Then, with one firm whack of the blade, she hit the pit, twisted the knife’s handle, and yanked out the shiny ball. In the ensuing crevice, she poured a tiny pool of balsamic vinegar. We were given spoons and told to enjoy; she need not have bothered with that final instruction. According to University of California Agriculture and Natural Resources site, there are ninety-seven varieties of avocado. My first taste was most likely the hybrid of Rudolph Haas, known as the Haas variety. It travels well and has a comforting creamy texture. Dessert: Ever tried avocado ice-cream? With a sprinkle of coconut? My mouth waters at the thought! Here’s a site that touts the many health benefits of avocados. Check it out! Avocados are native to Mexico, Central America, and South America. The first Europeans to eat avocado were the Spanish Conquistadors, and the first published notation of avocados was in the year 1519 by Martín Fernández de Encisco, a navigator from Seville, Spain. The Aztec’s called the fruit ahuacatl, the same name they gave to testicles. Accordingly, avocados (it has been said) encourage virility. Maybe that’s why guacamole is so popular. If I have fresh cilantro, I’ll add a chopped handful, but I’m a purist who loves the simple flavor of a perfectly ripened avocado. What’s your favorite avocado recipe? Olympia Iwinski gracing the entrance of what mission ruin? Do you know the name of this ruin? I have searched everywhere and still cannot find its location. My grandmother is the woman in the photo. Her brother lived in Tucson, Arizona. 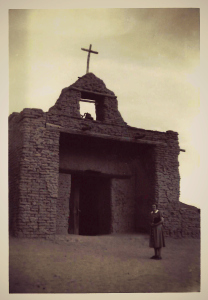 She had gone there to visit him at least once, so I think this mission church ruin is somewhere in that vicinity. But where? And is the church still standing? The photograph is undated (I imagine it was taken in the 1950’s). Someone please … help solve the mystery! If you recognize this old building, leave a comment below. As for another one of my myriad mysteries, if only I could find the name of Grandmother’s old transferwear china pattern. Oh how I love a good mystery … and history! And you! What do William Faulkner and Don Quixote have in common? Let’s just say it is something “… as secret as the grave” (Book IV, Chapter 62) now come to light. Too bad Faulkner could never pay his respects properly by whispering quietly at Cervantes tomb. “Between grief and nothing, I will take grief” (Faulkner, The Wild Palms). Today Cervantes, sometimes referred to as The Prince of Letters, continues to attract attention. After a long search in the Madrid Convent of the Barefoot Trinitarians, or Convento de las Trinitarius Descalzas, his tomb has at long last been found. Cervantes daughter was a nun with the Trinitarians, but this church is not the place of his original interment. First buried at San Ildefonso, his tomb was moved when the church underwent renovation. Reburied, of course, but where? Four-hundred-years is a long time to be missing. As Cervantes said in Don Quixote, “There is a remedy for all things but death, which will be sure to lay us out flat some time or other” (Book III, Chapter 10). Finally, did I mention how much I love to eat chili rellenos? These cheese stuffed chiles make my heart as happy as when I’m reading a really good book, and some of best homemade rellenos I’ve ever eaten are made at Cervantes Restaurant in Albuquerque, NM. Next time you visit, you should go!